Spring is quickly leading into Summer, which means we'll be encouraged to spend more time outdoors in Pioneer Trail. 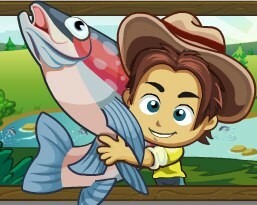 We can see that happening already through the new "Fishing Pond" feature, which allows you to teach your in-game children how to fish while completing four new collections and some goals along the way. A single Fishing Pole requires a Rod Ring and two Flexible Sticks, both of which can be earned by asking your friends to send them to you. For completing this first goal, you'll receive 450 XP, 400 coins and 10 Fish Bait. Bait is crated by using Fish Hooks and Wiggly Worms. The worms themselves are earned at random as they drop from American Moss (and rarely from Blueberries). The Fish Hooks, meanwhile, can be earned by asking your friends to send them to you. When you complete this goal, you'll receive 950 XP, five Blueberry crops and a Clown Fish. This is an animated, decorative fish that tells jokes when placed on your Homestead. The American Moss can be found on the game's free gifts page, while Rubber Overalls are crafted using Canvas Overalls and Rubber Padding (both of these come from friends). Complete this goal and you'll receive 1,400 XP, two Chunky Guppy Boosts and 20 Bait. This marks the end of the Fishing Pond feature, at least in terms of goals, with you receiving 2,600 XP, three Aged Salmon Boosts and 30 more Bait for finishing this final goal. As for the collections, you can now catch Trout, Salmon, Guppies and Carp to receive XP and fishing bonuses along the way. This feature will likely take you quite a while to complete, even if only for the mass amount of fishing you have to do, which requires so much bait. Still, if you stick with things, you'll slowly but surely finish it off. We wish you the best of luck in doing just that! What do you think of the Fishing Pond in Pioneer Trail? Will you take the time to fish enough to fill these four new collections, or will you stop as soon as you finish this goal series? Sound off in the comments.